14K Vanilla Gold® Sea Blue Aquamarine® 1 7/8 cts. Earrings with Chocolate Diamonds® 1/5 cts., Vanilla Diamonds® 1/6 cts. From the palest sky-blue to a deep sea-blue, the value of an aquamarine is determined by the color which is determined by traces of iron, the more intense and vivid the blue, the more valuable the gem. The origin of Sea Blue Aquamarine® is lbadan, a city in the hiliy, forested region of southwestern Nigeria. 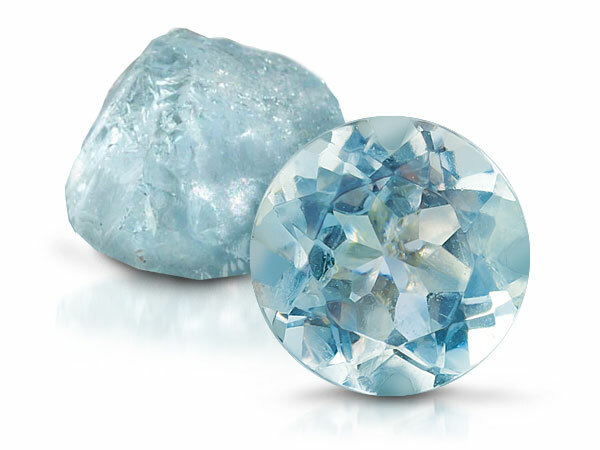 Aquamarine symbolizes youth, hope, health and fidelity. Legend tells that this soothing blue gem also places a soothing calm in marriage. Sea Blue Aquamarine® can be found within several Le Vian® brands depending on its accent stones: with Chocolate Diamonds®, le Vian Chocolatier®; with Blueberry Diamonds®, Le Vian Exotics®. 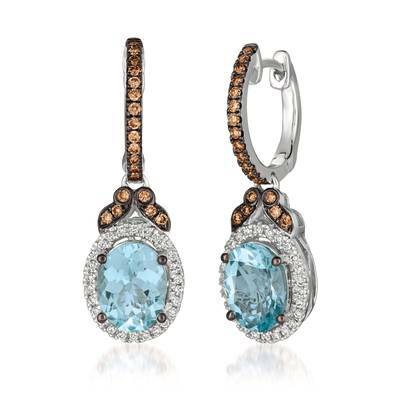 "Le Vian® aimed to find the perfect balance between soothing blue deep blue for its Sea Blue Aquamarine®, the March birthdstone, which uses the more saturated blues of ® and brings out their pedigree with special Le Vian® cutting techniques. "